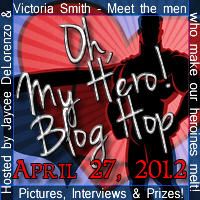 Oh, My Hero Blog Hop! We all love the heros of our Manuscripts and WIPs. They rescue our heroines, they're the ying to their yang, and they make us all swoon with delight! Well now it's time to let the world see them writers with this blog hop! 1. Post a Picture of your Hero! Creating your own set of questions to surprise us all! 4. Post our blog button to your blog! Also, it's not required, but feel free to repost the hop! 5. Post your entries on April 27, 2012 and hop around the other blogs through the linky! 2. How would you describe your heroine? 4. How would your friends describe you in one word? 5. What's your favorite pastime? 6. What's your idea of the perfect date? 7. Are you a morning or a night person and why? 8. If you won a million dollars what would you do with it? 9. If you had 24 hours to live what would you do/ where would you go? 10. What's your favorite comic book character and why? 11. If you had three wishes what would they be? 12. What's your favorite movie? 13. What is the first thing you notice about a woman that you find attractive? 14. What do you hold value the most in a potential love interest? From Jaycee: An ebook of your choice up to $15 from Amazon OR a Custom Blogger/WordPress Banner (up to 2 images). Your choice. Can't Wait to Meet All Your Swoonworthy Heros! Are you doing A-Z as well? Double posting is always awesome :) And thanks for joining. I am chopping at the bit to see your post! Okay I just got really excited. Micah sounds like a total swoonworthy name! It's going to be so much fun and thanks for coming to check them out. I think we're all going to be in for a big treat! Congrats on the 20sb april promotion! :) woop! This sounds like a very cool event! I'm all about discovering new swoony heroes :) And I already know the photo I want to use for mine! Fun. This will be a blast to go around and read.